It’s early in the morning. I have not had a restful sleep. Quite the opposite, in fact. I was kept awake for a number of different reasons, my (sub)consciousness unrested the entire time. I sighed, and got up, sitting perched by the edge of the bed. The room was cloaked in its darkness. The light was not turned on, for once, but the street lights peeked through the curtains, finding its way into this enclave of mine. I’ve often referred to my resting place, my home as the bat cave. It’s largely in reference to the fact that people find it difficult to contact me. I like it that way. I turn my phone off or put it in silent mode. Many have not accepted that, but then again, many have misunderstood the existence of a mobile phone to be a blank cheque for them to contact me anytime, anywhere they please. That’s not going to happen. It infuriates a lot of people, but the peace of mind I (sometimes) garner instead is worth it. Tonight, however, was anything but peaceful. A lack of electricity has thrown me back to the stone age, and it had left me feeling rather sweaty. My t-shirt stuck a little to my chest, and I took it off. The cool air covered my chest and arms, and I took a deep breath. It’s nearly five o’clock. Might as well, I thought to myself. I got up and prayed. At times, it is a systematic routine perpetrated by society at large as a way of weeding out the good and the bad, a system that helps to entrench further who is worthier than most. At times, it becomes a flawed method to (mis)judge a person’s character, the number of times a person bowing in reverence and submission accepted as proof of a person’s piety. At times, the religious fervour and favour surrounding this seems to override anything and everything else. The prayer system is a flawed one. Yet I do it. Why? 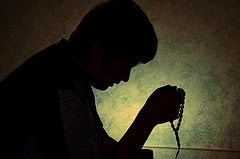 Force of habit can be considered, though I can’t claim to be the most disciplined of prayers. Despite the very best of my family’s efforts, my prayers have been sporadic at best. I pray when I can, which, if you believe in the principles of Islam, is probably not the best way forward. I do pray, though. I go through the motions, say the lines, and wish for the best for my friends and family. Sometimes, it feels a little empty, especially during mass prayers, and as your face is pressed to the floor, you’re left wondering whether the imam chose the longer verses of the Qur’an to get more pahala. The spiritual aspect is an important one, but I think it’s also important to consider the private character of faith and prayers. Praying is not without its physical benefits. Keep to the movements rigorously enough, and you’ll find that it works the muscles that needed working. The legs and stomach are given an especial workout; on one of the rakaats, the bending of the right food can be unnaturally strenuous. Keep at it, though, and a certain comfort arises of this. I pray for a number of different reasons, but a part of it is always something of an attempt to develop in myself a bigger discipline that can be beneficial for other purposes as well. The five prayer times, for example, are prime times for those wishing for a productive day. Subuh is when the early bird should be up and about to catch the worm, while the day prayers are physical and spiritual breaks from this tiring chase, allowing you to take a step back, recharge and recalibrate the perspective that may have gone awry in that time. The maghrib prayers should probably be done at home, at a time when you should already be with your loved ones, while isyak is a good indicator of when you should already be winding down for the day. Spirituality can be a fulfilling existence, and I get that from this as well, but to claim that it is without its real world benefits would be fallacious. Those who are able to maintain this on a regular basis usually works more effectively, emboldened ever more by this strong discipline. Even the political leaders who cheat the people are more effective in doing so precisely because of the discipline that acts such as these prayers helped to build. It is not the only way to be disciplined, of course, for to the sea the rivers run. For me, it is a clear example of the real world wedded to a more spiritual one that does not have to be a negative. Of course, after I did the subuh prayers, I went straight to bed and fell asleep. So much for discipline. At least I’ll be up in time for zohor.